She said her private life "has already been made too public"
BUENOS AIRES, Argentina (CNN) -- The woman with whom South Carolina Gov. Mark Sanford had an affair broke her silence Sunday long enough to say she wouldn't discuss her relationship with the now-embattled governor. South Carolina Gov. Mark Sanford admitted to an affair with Maria Belen Chapur of Argentina. In a statement released to Argentina's C5N television network, Maria Belen Chapur said her private life "has already been made too public during these last days, bringing to me even more pain." Sanford admitted last week that he had an extramarital affair with Chapur, a former television reporter. The 49-year-old governor's admission came after he disappeared from the public eye for nearly a week, with aides telling reporters he had gone on a hiking trip along the Appalachian Trail. Chapur said she had a "firm suspicion" of who hacked into her e-mail account in late 2008 and shared those communications with The State, the South Carolina newspaper that printed excerpts from them after the affair became public. But she would not disclose details, saying that without sufficient proof, "I am myself forced to maintain the individual's name in anonymity." "I am not the one to judge anyone," she said. "I leave this in God's hands." Sanford had been mentioned as a possible Republican presidential contender in 2012 and had waged and lost a recent battle to refuse money from the Obama administration's economic stimulus package. His tearful admission Wednesday has led to calls for his resignation from at least two state newspapers and a demand from a Democratic state lawmaker into whether he misused state property or funds to pursue his extramarital affair. 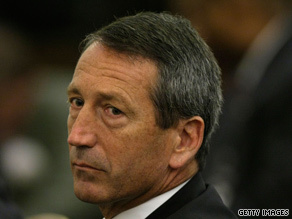 Sanford disclosed the relationship after a reporter for The State found him getting off a plane from Argentina in Atlanta, Georgia. He and his wife had separated about two weeks earlier. Asked Friday whether he could survive the issue politically, he said: "I'm just trying to survive today, is what I'm trying to do." Brian Byrnes contributed to this report for CNN.